Once large clumps of mass start sticking together in a protoplanetary nebula, the formation of a planetary system becomes a phenomenally complex N-body gravitational dynamics problem. Many of the innumerable small bodies in this mess will eventually coalesce into planets or orbit indefinitely as asteroids or comets. But some of them will get a dynamical kick and be ejected from the system, sent flying through interstellar space. Indeed, some simulations suggest that fifty times as many comets were ejected as survive in the solar system today. This population of icy comets and asteroids could plausibly host more oxygen than the gas phase of the interstellar medium! But we’ve yet to find a comet that isn’t gravitationally bound to the Sun, so how can we tell if the interstellar medium really is host to many orphaned comets? 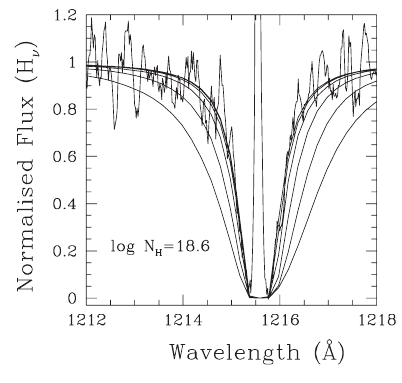 Illustrating the very low hydrogen abundance in the helium-dominate white dwarf GD 190. This is the Lyman-alpha absorption feature of hydrogen. The core of the line profile comes from interstellar hydrogen, while the shape of the wings is due to hydrogen in the white dwarf atmosphere. The innermost line overplotted on the spectra represents H/He=10^(-6.5). From Fig. 5 of Petitclerc et al. (2005). In a new paper, Michael Jura of UCLA checks for the existence of interstellar comets by looking for traces of them in helium-rich white dwarf atmospheres. White dwarfs are the degenerate remnants of stars with masses like the Sun; they’re basically tiny, condensed husks of carbon and oxygen that sit quietly in space, slowly cooling by blackbody radiation until the end of time. Most white dwarfs have some hydrogen leftover from their progenitor star that settles into the outer layer of their atmosphere, but some have very little hydrogen and so their atmosphere is mostly helium ( ). Jura points out that a single comet may host more hydrogen than a typical helium-dominated white dwarf. The author builds a simple analytic “toy model” for the amount of hydrogen visible at the surface of a white dwarf that addresses convection, mass loss due to winds, and hydrogen accretion from comets and asteroids. To entertain the analysis of such a complicated astrophysical problem with so many uncertain parameters, the author works under several assumptions. For example, he assumes that the remnants of the impacting comet will quickly rise to the surface of the white dwarf due to entropy considerations and that white dwarfs without companion stars will not lose mass to periodic nova eruptions. By comparing this model to the upper bound on hydrogen abundance established by the UV spectroscopy of two particular white dwarfs by Petitclerc et al. (2005), Jura argues that these objects could not have had many impacts with interstellar comets or asteroids. He uses this inference to suggest that the actual amount of interstellar oxygen bound up in these “iceballs” is less than 1%, challenging some models predicting the formation of Oort-like clouds around other stars. “tiny, condensed husks of carbon and oxygen that sit quietly in space, slowly cooling by blackbody radiation until the end of time” Very poetic, Nathan!